On the 25th September 2014 the Warrenpoint community came together for A Coffee and Cake morning at The Whistledown Hotel from 9.30-11.30am. The event was organised by local girl Jennifer McCormack who was overwhelmed by the great turn out to her event. Everyone from the community gave a helping hand and Jennifer would like to give thanks to The Whistledown Hotel and their great staff for supplying the venue, coffee’s and tea’s, O’Hare’s Bakery for all their wonderful scones they donated, Around a Pound for helping out with the balloons, her entire friend and family circle who helped her immensely with baking and last but not least the complete community for showing up and lending their support to herself and her chosen charities PIPS Newry and Mourne and MacMillan Cancer Support. Altogether a great amount of £1401.60 was raised of which £700.80 was given to both charities. PIPS Newry and Mourne would like to give a very special thanks to Jennifer for organising such a successful event in the Warrenpoint area and for the local people for showing their support. Well done to everyone involved. 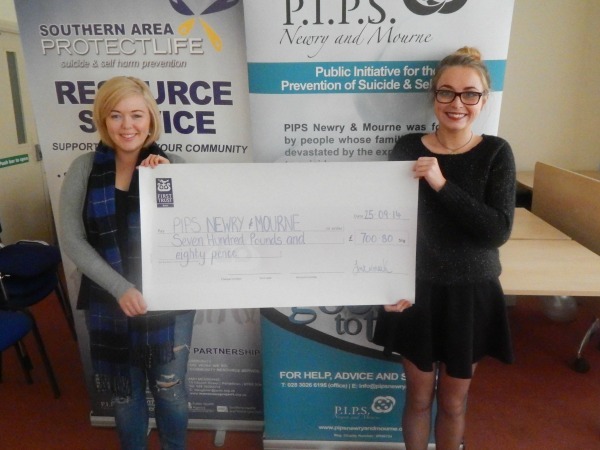 Pictured below is Jennifer McCormack presenting the cheque of £700.80 to PIPS Newry and Mourne and her sister Amy Henshaw.